Reel Island is the 2015 creation from Imperium Network Solutions. It runs with a UK and a Curacao gambling license. The UK brand has opted for a tropical island’s colored, vibrant and positive design scheme. The blue and yellow reflect the blue sky and sand colors, and are easy to rest your eyes upon. One of the biggest gambling characters, Gonzo from Spinata Grande and Starburst is greeting you with the welcome bonus package. Also the animated logo of Reel Island Catches your attention. The website’s layout is well balanced, categories and games are easy to find. You even have a search field for a quick look after your favorite game. As you would expect, from the naming and logo, the website has a big offer of slot games, but not only. Jackpot, casino, live casino, bingo, keno, virtual race book and soccer are also part of the games on display. All the games at the casino can be played in mobile mode and customer assistance is always happy to solve any problems you might have. Most of the games on display at Reel Island Casino have two playing modes: play for real and play for fun. This means that the casino is suitable both for high rollers, for rookies or gamblers that want to get used to the game before they commit with real money. The players that do involve with funds and win are highlighted on the right side panel, under latest winners. You can see the amount a user won on which game. There is also am encouraging jackpot totals field, that shows over £3,800,000 won since the website was launched. NetEnt, Leander and NYX/Next Gen Gaming are some of the most known gaming software providers. However, these are not the only gaming brand you will find on Reel Island. Amaya, Aristocrat, Elk gaming, Leander, 1×2 Gaming, 2 by 2 Games, Multicommerce, Quickspin, Thunderkick and WHG are other game providers you will encounter on this website. deo slots, jackpot slots, progressives, and other games like black jack, roulette, baccarat, casino poker and virtual sports. 25% up to £400 and 50 free spins on Guns’n Roses, on the third deposit. 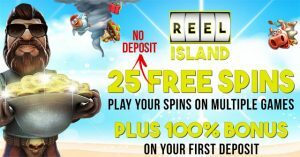 You have to deposit minimum £20 to receive the bonus and the free spins. The deposit and bonus cash have to be wagered 35 times. Reel Island also has other types of promotions. Every deposit gets a 10% bonus, up to £50. The loyalty program has three levels: bronze, silver and platinum. You earn around three points at a £10 wager, and you need 5,000 points to progress from bronze to silver, and 50,000 to reach platinum. Also, every 200 points are rewarded with £1. The Reel Island website is fully optimised for mobile users. Games, bonuses, contact support are all available with the same simple and easy to use design. Deposit and withdrawal are possible with many methods: Visa, Credit and Debit Card, Maesto, Neteller, PaySafeCard, POLi Payments, Skrill and Ukash. The minimum deposit is set to £10, and withdrawal to £30. Deposits are made instantly, but withdrawals take between two and seven days to reach your physical account. Questions from clients are answered within minutes on the live chat and e-mail services. Live chat is operational 24/7 and the e-mail services is guaranteed to have a maximum 24 hours reply.